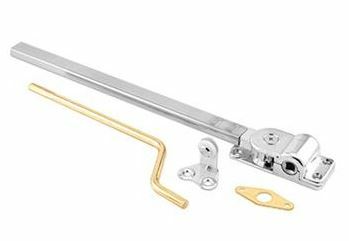 WINDOW CRANK HANDLES, PARTS & HARDWARE for casement, awning and jalousie windows. FOLDING HANDLES. TRUTH HARDWARE. T-CRANK HANDLES, Repair and replacement. Any part for any window, door and more. More than 40,000 parts including all WINDOW CRANK HANDLES for WINDOW OPERATORS. Custom manufacturing, special order. Research Department. Send a sample. FREE CATALOG from Blaine Window Hardware.